Antiperspirants containing aluminum, work to completely stop perspiration from occurring. Deodorants do not contain aluminum. Deodorants allow perspiration. They work to kill the bacteria that causes odor when we perspire. From a purely natural standpoint, it makes more sense for us to use deodorants, as it is clearly a more natural process to allow our bodies to sweat. Of course none of us wants to emit an unpleasant, offensive odor, but aluminum-free underarm deodorants do work to keep us feeling clean and fresh. Most commercial brands of deodorant contain a variety of harsh chemicals that are detrimental to our health. Only one of them is aluminum, which can be toxic and is potentially quite dangerous to our health. 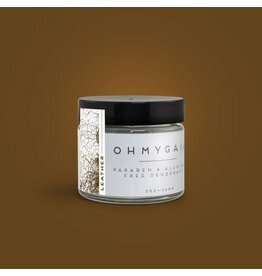 Ohmygaia product base uses only natural, organic ingredients. 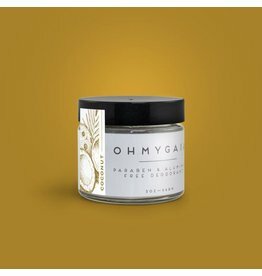 They have added essential oils and/or fragrance oils so you can find the perfect scent that's right for you.